Ferdinando Bologna (27 September 1925 – 3 April 2019) was an Italian art critic. The Suor Orsola Benincasa University of Naples is a private university located in Naples, Italy. It was founded in 1895 and is organized into 8 departments. Max Ascoli (1898–1978) was a Jewish Italian-American professor of political philosophy and law at the New School for Social Research, United States of America. Benedetto Croce was an Italian idealist philosopher, historian and politician, who wrote on numerous topics, including philosophy, history, historiography and aesthetics. In most regards, Croce was a liberal, although he opposed laissez-faire free trade and had considerable influence on other Italian intellectuals, including both Marxist Antonio Gramsci and fascist Giovanni Gentile. 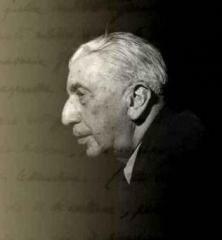 Croce was President of PEN International, the worldwide writers' association, from 1949 until 1952. He was nominated for the Nobel Prize in Literature sixteen times. From 1970 he was ordinary member of the National Society of Sciences, Letters and Arts in Naples, and ordinary non-resident member of the Pontanian Academy of Naples for the history, archeology and philology class. In 2003 he founded the six-monthly periodical “Confronto. Studies and research in European art history". Francesco de Sanctis was a leading Italian literary critic and scholar of Italian language and literature during the 19th century. The Accademia di Belle Arti di Bologna is a public tertiary academy of fine art in Bologna, in Emilia-Romagna in northern Italy. It has a campus in Cesena. Giuseppe Prezzolini was an Italian literary critic, journalist, editor and writer, later an American citizen. Pietro Negroni, also called Il Giovane Zingaro and Lo zingarello di Cosenza was an Italian painter of the Renaissance period, active mainly in Naples. He was known for his altarpieces, mythological scenes and portraits. Alberto Melloni is an Italian church historian, primarily known for his work on the Second Vatican Council. Federico Chabod or Frédéric Chabod was an Italian historian and politician. Giuliano Briganti was an Italian art historian. Pietro Trifone, is an Italian linguist. Giovanni Verardi is an Italian archaelogist specialising in the civilisations of central Asia and India. With extensive academic and fieldwork experience, he has published findings about sites in Afghanistan, Nepal, India, and China in particular. Verardi has joined or directed several long archaeological missions to central Asia, and held positions on numerous Italian scientific boards. He has a particular interest in Indian iconography and history. Mario Salmi was an Italian art historian and art critic who spezialized in Romanesque architecture, Tuscan sculpture and the early Italian Renaissance. Enrico Crispolti was an Italian art critic, curator and art historian. From 1984 to 2005 he was professor of history of contemporary art at the Università degli Studi di Siena, and director of the school of specialisation in art history. He previously taught at the Accademia di Belle Arti in Rome (1966–1973) and at the Università degli Studi di Salerno (1973–1984). He was author of the catalogues raisonnés of the works of Enrico Baj, Lucio Fontana and Renato Guttuso. He died in Rome on 8 December 2018. Aldo Alessandro Cutolo was an Italian academic, television presenter, actor and historian. Adolfo Venturi was an Italian art historian. His son, Lionello Venturi, was also an art historian. Nicolò or Niccolò Porta was an Italian painter of the late-Baroque period. Girolamo Arnaldi was an Italian historian. Ludovico Valenti was an Italian nobleman, ecclesiastical lawyer, papal bureaucrat, Cardinal, and Bishop of Rimini. Antonio Giuliano was an Italian classical archaeologist and academic. Lionello Puppi was an Italian art historian and politician.